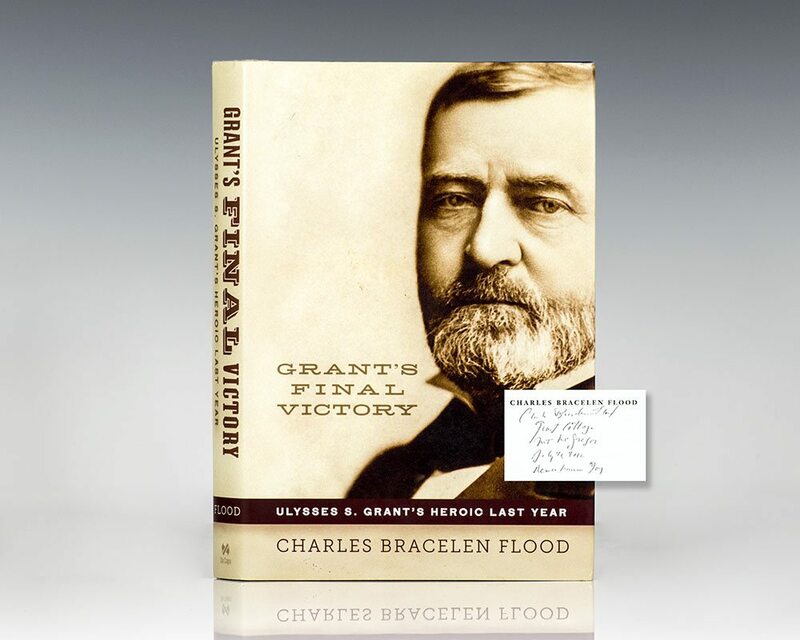 Grant’s Final Victory: Ulysses S. Grant’s Heroic Last Year. New York: Da Capo Press , 2011. Octavo, original half cloth. Signed by the author on the title page, “Charles Bracelen Flood Grant’s Cottage Mt. McGregor July 2, 2012 Remembrance Day.” Fine in a fine dust jacket. Shortly after losing all of his wealth in a terrible 1884 swindle, Ulysses S. Grant learned he had terminal throat and mouth cancer. Destitute and dying, Grant began to write his memoirs to save his family from permanent financial ruin. As Grant continued his work, suffering increasing pain, the American public became aware of this race between Grant's writing and his fatal illness. Twenty years after his respectful and magnanimous demeanor toward Robert E. Lee at Appomattox, people in both the North and the South came to know Grant as the brave, honest man he was, now using his famous determination in this final effort. Grant finished Memoirs just four days before he died in July 1885. Published after his death by his friend Mark Twain, Grant's Memoirs became an instant bestseller, restoring his family's financial health and, more importantly, helping to cure the nation of bitter discord. More than any other American before or since, Grant, in his last year, was able to heal this—the country's greatest wound.